Samir and his best friend Carlyle take a long-awaited camping trip in the Canyon. A rainstorm evokes emotional confessions and spectral visions. Samir learns alternative methods for dealing with demons. A veteran caravaner leads the party to a disturbing scene. **Before we jump in, a note on our content: CARAVAN is created for adult audiences only. We advise listener and reader discretion for graphic depictions of violence, frank portrayal of sexuality, discussion of mental illness and existential struggle, and some downright filthy language. It gets mighty dangerous in the Canyon, but if you need a breather—we’ve got your back. Whenever you’re feeling ready and able, we hope you’ll join us. Created by Tau Zaman. Produced by Tau Zaman and Mischa Stanton. "Riders In The Sky" was written, directed & edited by Tau Zaman. Sound design by Mischa Stanton & Anna Rodriguez. Theme music by Evan Cunningham; additional music by Mischa Stanton. Visual art by Marina Vermilion. Press kit by Kyle Boyce. Teaser: Have You Ever Seen the Rain? Rain comes to Wound Canyon. 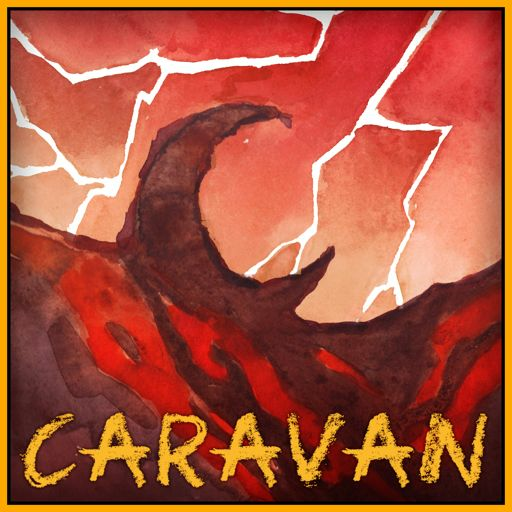 Introducing Caravan. Written & directed by Tau Zaman. Coming early 2019. A nightmarish duo plot to tighten their hold over the Canyon. Samir meets a charismatic cowboy and a suspiciously fantastical creature. A crack sharpshooter is more than they appear. Samir learns the lay of the land, and starts demanding answers. The winding road takes a turn for the deadly when a supernatural force attacks. Can Samir survive, separated from the caravan? The caravan finally arrives at Houzon Circle, but they can't hang up their hats just yet.